Issues: Video and story section. This improved version of the Guard Armor still uses the same basic tactics. The powerful shockwave it produces causes it to drop its head. Strike then and the body will eventually fall to pieces. Start with limbs and take them all out. The Powered Armor is an Emblem Heartless that is found in Kingdom Hearts 358/2 Days. It is one of the bosses at Twilight Town. The Powered Armor's body is divided into several pieces—a body, a head, two arms, and two legs—none of which are directly connected to each other and all of which can act independently of the other. Its body is vaguely hour glass-shaped, indigo, and has light indigo additives on it. The Heartless emblem is emblazoned on the center of the armor. Its head is light indigo, spherical, and sports three silver spikes and a silver faceplate with several holes in it. Both of its hands are indigo with wide wrists and three silver, segmented fingers. Its legs are short, indigo, and ends in large, hammer-like, black feet. All of the pieces of the Powered Armor seem to be hollow. The Powered Armor's name reflects its armored body and greater strength when compared to the Guard Armor. Spinning Claw: The Guard Armor's gauntlets spin around. Stomp: The Hammerlegs stomp around. Tornado: The Armored Torso spins around at high speed. Smash: The Guard Armor jumps into the air and body slams Roxas. The Powered Armor is, true to its name, a tough boss to bring down. At the start of the battle, Lock-On and attack. Use caution, as the Heartless swipes at Roxas with its claws if he gets too close. While it remains stationary throughout most of the duration of the battle, the Powered Armor's mighty footsteps cause shockwaves to erupt, which is another thing to be careful of while fighting at close range. While it still has its legs, the Powered Armor will periodically pause, giving Roxas an opening to attack, then begin walking around, creating shockwaves (as well as swinging its arms if it has them). It will take six steps before stopping again. When the Powered Armor's head falls off, attack repeatedly as the boss feels around blindly. It will not move at this time, so utilize attacks and magic to the maximum. If any -Combos are available, use them instead of combos, as they will save time and therefore do more damage. 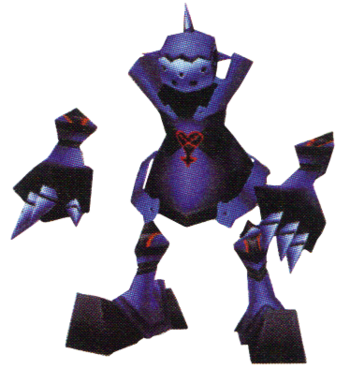 Once it finds its head, the Heartless spins its arms around it, dealing large amounts of damage to Roxas if he cannot escape the attack. Its limbs and body now begin to separate, attacking with minds of their own. When only the beast's torso is left, it begins to spin around in a desperation attack. The HP Bars of each of these limbs must be depleted including the head and torso, each with 1-3 HP Bars. At this point, close combat will likely result in a quick death, so use long range high-level spells. Be cautious when using a Limit Break as the boss can still cause damage while Roxas is attacking. Powered Armor tends to get vicious towards the battle's end, so be sure to heal periodically. It should be noted that blocking the Powered Armor's Spinning attack will cause it's head to fall of, leaving it wide open for further attacks for a few seconds, enough to get in a few combos and deplete around 1/3 an HP Bar. This page was last edited on 3 April 2019, at 18:28.